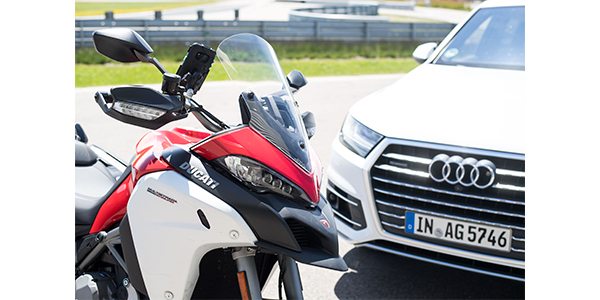 Ducati continues to invest in safety and, together with Audi, participated in the first demonstration in Europe of a new vehicle-to-everything (V2X) communication system between motorcycles and cars. As announced in April, the Bolognese company has outlined a strategic line, called “Safety Road Map 2025,” for the development of new safety systems and technologies. The first steps in this strategy are the extension of the ABS cornering to the entire range and the introduction of a bike with front and rear radar on the market in 2020. In addition, the Borgo Panigale company is experimenting, together with various industry leaders, some new technologies that will equip its bikes in the medium and long term. One of these technologies is called C-V2X and it is a wireless communication system between road users such as cars, motorcycles, pedestrians and bicycles and infrastructure. C-V2X technology is a key step toward 5G for automotive applications with direct communication between vehicles and their surroundings. The demonstration featured Audi Q7 and Audi A4 road vehicles, as well as a Ducati Multistrada 1200 Enduro two-wheel vehicle equipped with C-V2X technology utilizing the Qualcomm 9150 C-V2X chipset solution. The showcase demonstrated common situations that can take place between motorcycles and vehicles, and how C-V2X technology can be used to help improve road safety. These include intersection collision warning, where a vehicle equipped with C-V2X technology pulls out from a junction with an adjoining road and avoids hitting a motorcycle rider who has the right of way, as well as across traffic turn collision risk warning, in which a vehicle avoids a left turn collision with a motorcycle. Finally a warning of sudden braking of the leading two-wheel vehicle. This demonstration was the first of the ConVeX (Connected Vehicle to Everything) project involving Audi, Ducati, Ericsson, SWARCO, the Technical University of Kaiserslautern and Qualcomm CDMA Technologies GmbH.